Sometimes a piece of theater starts off so well. The plot is intriguing. The commentary is stimulating. The actors are great. And then a curtain gets ripped down and everything that just came before is wiped away for something so tentative and sybaritic that it’s as if the audience is no longer wanted. That, unfortunately, is what happened in the racial-charged Black Protagonist by The Associates. Virtually broken into three sections, Black Protagonist is a gripping drama about a stimulating race-centric article that causes more turmoil than possibly imagined. 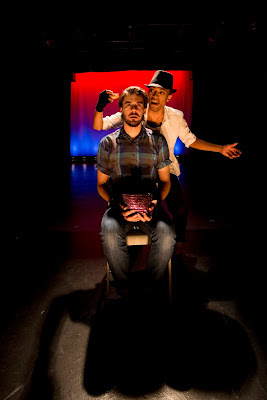 Devised by the company, Black Protagonist follows WH, a young writer, who is encouraged to publish an article about race and identity where his unsuspecting boyfriend is the focus after Robbie reveals that, despite his appearance, he is of mixed race. With themes ranging from the obvious to the thought-provoking, Black Protagonist allows a very interesting conversation to occur while the plot is able to be the primary focus. That is until the curtain is yanked down. The majority of the first part of the play is character driven and enticing, but when the conflict between WH and Robbie is resolved, Robbie enters a dream-like state that takes Black Protagonist on an unfortunate detour. No longer is the plot driving the conversation, the absurdity takes over and the social commentary is transparent. Sure, the content still lives within the themes presented but structurally, what used to be WH’s story has veered into Robbie’s. If this portion of the piece were integral to the overall storytelling, perhaps finding a way to present it within the confines of the first section would offer a cohesive journey. What were once scenes turns into movement pieces, accents, and out-of-character monologues. But once the dream-like world had finished, things take yet another detour where characters are no more and the actors have a conversation about their process. The experimental nature of the ending was not what the piece desired. Until this point, The Associates did something many other devised works cannot do: tell a story the audience feels a part of and can understand. Their storytelling through plot proves their craft and ingenuity. Literally telling the audience in the final scene came across as forced, ensuring that their message was heard loud and clear. They should trust their great work because that first section of the show said it all. It lives proudly on its own. Despite a cohesive story, this was WH’s journey. Casey Worthington as the writer showed promise. While he may not have had too much chemistry with Jamal Abdunnasir’s Robbie, Worthington meshed well with the others, especially the spitfire Liv played by Lauren LaRocca. LaRocca’s fast-talking Liv had that conniving encouragement that truly set the plot ablaze. Abdunnasir as Robbie played upon the intricacies that the character provided. Of all the characters, Robbie had the most depth. It’s perhaps a character and story that doesn’t get represented in this manner on stage. And that’s what was fascinating about Abdunnasir’s approach. It was genuine, even though the mystery was gone at the end. Emily Stout as Jen, the outsider of the group, was spunky and fun, allowing the light moments to come through. Timothy Craig as Donald and Peregrine Heard as May had their finest moment during their trio with WH. What Craig and Heard did was allow their perspectives come through as candid without pandering to the point. Peregrine Heard took on the role of director as well as playing a role in the piece. Heard’s vision in the first section of the play was simple and clear: tell an important story. Even with moving parts coming and going during transitions, they were done like clockwork allowing the momentum to continue. Lighting designer Tyler First kept the world simple and bright in the first part of the play and had a field day when the curtain revealed the scrim and the use of the color. The scenic design by Sarah Johnsrude had quite a cohesive feel to it. Every scenic element was unified in color, intentional or not. Relaying the exact message to an audience may not always translate. You try your best to allow it to come across naturally by permitting opinions to be formed. That moment when the message is transparent, the credibility is lost. Finding a way to incorporate the message from the latter part of Black Protagonist into the story will allow this play to become something important. Once it’s cleaned up, The Associates have something special on their hands.